What is the TV Booster? The Indian Wells Valley TV Booster (IWVTVB) is a not-for-profit volunteer organization that has been receiving, translating, and rebroadcasting TV and FM radio stations' signals to the IWV since about 1950. Before cable and satellite TV signals were available, the TV Booster system was the only means to provide TV and FM reception for the residents of the Valley. Today, many valley residents support the IWVTVB so that they can receive over-the-air HDTV programming with image quality that is unavailable from and superior to that available from satellite or cable services, while others continue to support the IWVTVB so that those without satellite or cable service can receive TV and FM radio over the air. 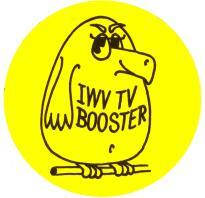 The Booster's equipment is bought and maintained with funds donated by residents of the IWV. Other residents donate their time and services to keep the equipment operating and to make improvements. TV and FM radio signals originating in Los Angeles and Las Vegas are received on the south face of Laurel Mountain. (Laurel Mountain is where you see the white "golf ball" radar dome south of Ridgecrest.) The digital TV signals are error corrected and re-equalized and then "translated" to UHF frequencies and transmitted at low power (25 watts) from the north face of Laurel Mountain. If you use a UHF antenna these are the signals you receive. The FM radio signals are translated to alternate frequencies and also transmitted from the north side of Laurel Mountain. The digital TV signals are received on "B" Mountain on the northeast side of Ridgecrest. Those signals are then converted to analog TV signals on their original VHF frequencies and transmitted from "B" Mountain. If you use a UHF/VHF combination antenna you will receive these signals. The Boostergram is our annual newsletter mailed out in late October to the people who have asked to be put on our mailing list. K258BS 99.5 KPFK 90.7 Pacifica Network Good; occasional multipath interference. K296AI 107.1 KCNV 89.7 Classical Good; subject to dropouts from Sporadic E skip. The Board meets on the first Monday of each month, unless it falls on a holiday and then it meets on the second Monday. Board meeting boilerplate agenda form.